Ukrainian fighters are stuck in a bureaucratic bottleneck as commanders delay permission for soldiers to defend themselves against rebels. He stood smoking in a gutted building in Pesky, one of the war’s deadliest stretches of the frontline in the conflict between Ukrainian forces and pro-Russian rebels. The scant choice of Ukrainian radio programmes may seem trivial. But it highlights the gulf between frontline fighters and their superiors, and signals a wider breakdown in communication occurring on the restive nation’s far eastern limits. Red tape is stifling Ukraine’s war effort, they say, as military commanders allegedly delay and even ban soldiers from responding to artillery attacks from pro-Russian rebels. When bombarded from enemy positions, government units regularly have to seek permission for a counterstrike from superiors removed from the action. But they complain of an inefficient chain of command and say the fight is lost in a bureaucratic bottleneck. Heavy weapons are ready to use, but often high command must first give the green light. “That comes too late,” one officer told The Independent on Sunday. Ukraine is keen to publicise its compliance with February’s crumbling ceasefire deal agreed in Minsk. The government wants its armed forces to be viewed as a responsible force that resorts to heavy weapons only in defence. Do the soldiers accept that the peace accords are, in part, reason for the limits on the force and frequency of counterstrikes? “Not at all,” said Bardan, echoing the response heard across the frontline among government and rebel fighters. Heavy exchanges of artillery this month around the rebel-held city of Horlovka and the small, government-held town of Starohnativka, killing civilians and soldiers alike, would support such a statement. Oleksiy Melnyk, a foreign relations and international security expert in Kiev, points to deeper systemic issues. “Decisions are made two to three levels higher than in the British military,” he said, with commanders sometimes even seeking permission from civilian leaders in Kiev. Some senior Ukrainian commanders have also faced criticism for strategic failures and mass casualties, Mr Melnyk said, and try to shift responsibility to avoid possible flak. Yesterday, France’s President François Hollande spoke to German Chancellor Angela Merkel and Russian President Vladimir Putin and said that all three backed a complete halt to ceasefire violations from this Tuesday, a plan that had been mooted, according to the Organisation for Security and Co-operation in Europe (OSCE) which monitors the conflict. OSCE observers have noted an increase in ceasefire violations involving artillery. 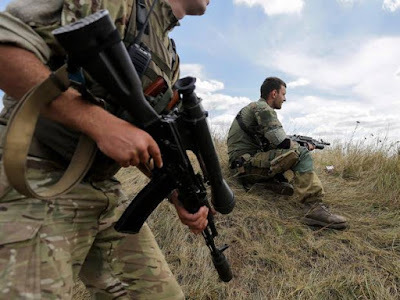 In an interview with The Independent on Sunday, Viktor Muzhenko, the commander-in-chief of Ukraine’s armed forces, confirmed that troops “all along the frontline” have to seek permission from senior military commanders before responding with artillery. But he insisted that this was because of the ceasefire deal signed in Minsk and said the procedure was “optimised as much as possible”. “We do not keep firing back because the Ukrainian side will fulfil its promises, including those made in the Minsk agreements,” he said. “We also want to show the civilised world that we are ready to resolve the conflict on a political level. “Our position allows us to disprove the cynical propaganda from Russia,” he added, with Russia having been repeatedly accused by Western nations and Ukraine of backing the rebels and having forces directly involved in the conflict. Russia has denied this despite mounting evidence of troop numbers. “They try to portray us as the instigators of the war and to absolve themselves of responsibility for the deaths of thousands of people,” Mr Muzhenko said. Mr Muzhenko denied that permission necessarily had to be granted from Kiev, and said local commanders had the authority to sanction artillery attacks after notifying officials from the OSCE. Pesky’s destruction bears all the hallmarks of repeated blitzes from missiles, mortar rounds and artillery shells. In the town, Vasily, a sniper, surveys no-man’s land from his barricaded lookout. Next year marks a quarter of a century of independence from the USSR. Where did Vasily expect his country to be then?